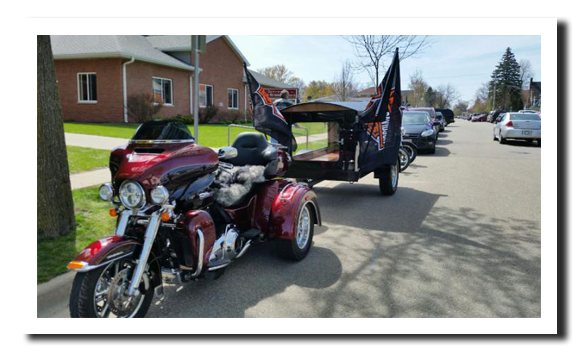 This service came about after a motorcycle accident on August 28, 2013 that took the lives of two of our dear friends. The community was in mourning and shock and wanted to pay tribute in a way fit for the motorcycle enthusiast. 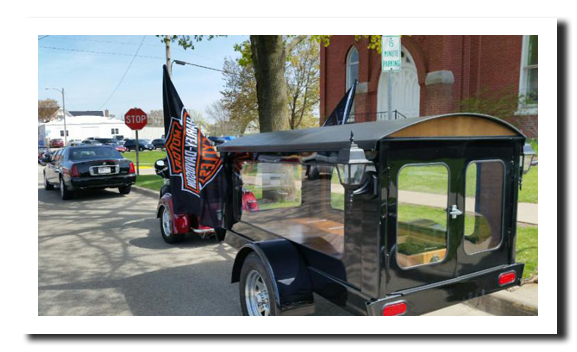 It took many hours to find a service that could provide a motorcycle procession from the church to the cemetery. Our services offered are in memory of David and Joan Edge and provides the opportunity to let the ground rumble one last time. Farewell My Friend is a hearse that was built by local people in our small community and was a project that came to life from compassion and caring. We are not a factory built hearse, but one from imagination and by hard working individuals. Our services can accommodate a traditional casket to an urn.